South Africa vs Pakistan 3rd T20I: It was probably the longest runout ever in terms of time taken by the third umpire to give the decision. 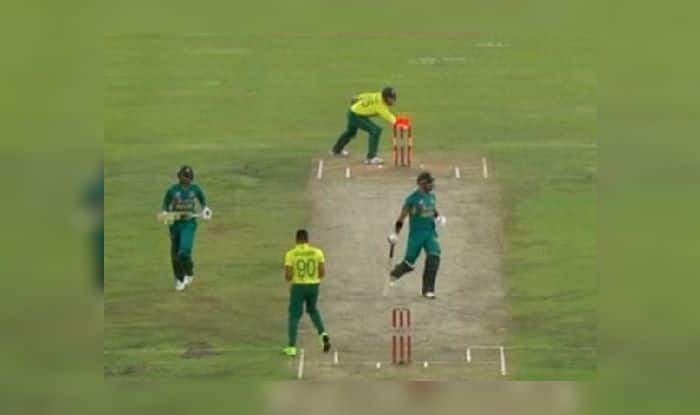 South Africa vs Pakistan 3rd T20I: It was probably the longest runout ever in terms of time taken by the third umpire to give the decision. The event happened during the 3rd T20I at Supersport Park in Centurion. The third umpire took way to long to make up his mind to give the decision. Malik was on strike whereas Hussain Talat was at the non-striker’s end. Malik clipped the ball on the leg side and took off for the run, only to realise that his partner had not responded to the call and Malik had by then overrun him. The umpire was confused about the fact that Malik had crossed Talat or not when Quinton DeKock took off the bails. After taking everything into consideration, the third umpire made up his decision as he adjudicated that the Pakistan skipper was the one who had to leave. Malik scored 18 off 16 balls. The dismissal of Malik changed the tables in favour of the hosts who went on to win the match by 27 runs. “Win always give you satisfaction. Our youngsters have learned a lot from this tour. If we look at three T20 games, we could have won the first two, but these things happen in cricket. I hope, our players have learned from these situations. Shaheen Afridi has great talent and he is improving day by day. I have seen him bowling in nets and he tries to learn variations which is very different. I am still trying to find out how we keep finding these (talented) fast bowlers. We want more batsmen who can take Pakistan cricket to another level. We have seen Babar Azam and Imam impress and we need more guys to like that to compete overseas. PCB has been invested a lot and it kept giving opportunities. It is just not about that, but Babar has developed his game and same with Imam. I hope the other guys learn from them. I would like to congratulate the South African team for winning all three series,” said Malik at the post-match press conference.